In Stay Well Soon Stevie’s dream horse is called Atta Girl. This was the name of my dream horse when I was a kid. 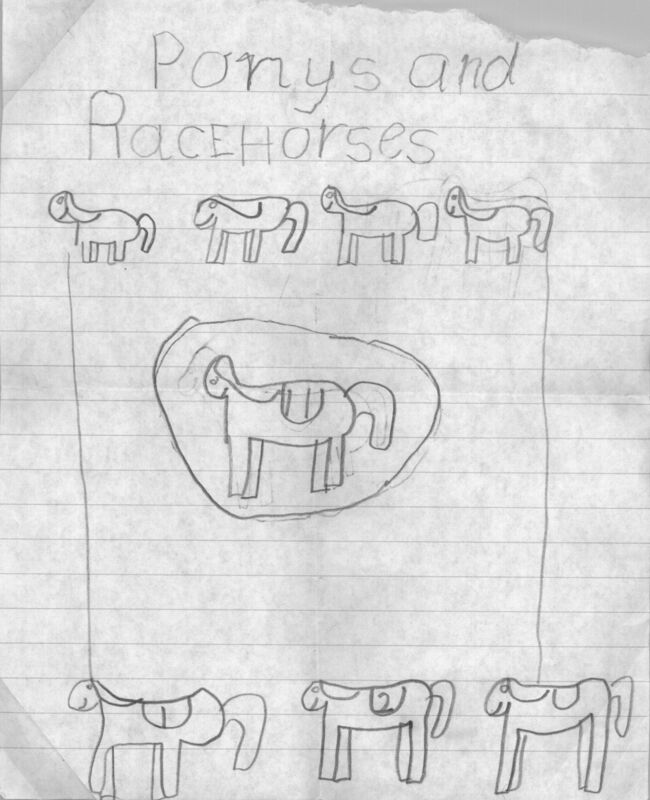 However, my dream horse Atta Girl was brown with a black mane and tail, whereas Stevie’s dream horse Atta Girl is grey with a silver mane and tail. So two completely different dream horses and no-one can say that Stay Well Soon is autobiographical. 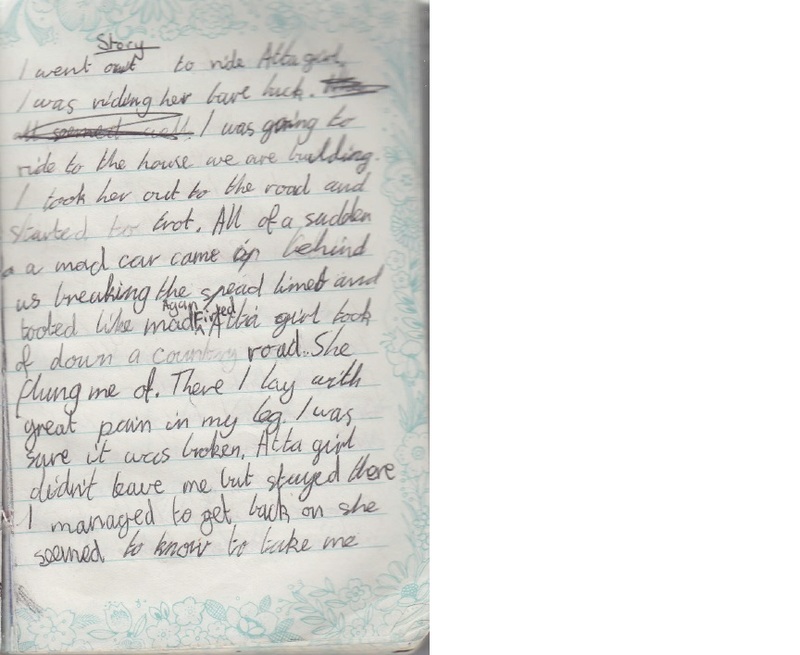 I wrote this story about Atta Girl in my diary in Grade 4. I went out to ride Atta girl. I was riding her bare back. I was going to ride to the house we are building. I took her out to the road and started to trot. All of a sudden a mad car came up behind us breaking the speed limit and tooted like mad. A gun fired. Atta girl took off down a country road. She flung me off. There I lay with great pain in my leg. I was sure it was broken. Atta girl didn’t leave me but stayed there until I managed to get back on she seemed to know to take me back home. Good old Atta girl. There is a lot more action in this short story than in the books I write now. In my current work the characters sit around reading and drawing a lot. There are no guns and if someone set off to visit the house they were building, they would probably arrive safely, have a boring conversation with the builder, agonize about the meaning of life internally and go home again. I’m also intrigued by the questions that this piece raises. Was there anyone driving the ‘mad car’ or had a car come to life and developed anti-social mental health issues? Why was the car (or possibly the person driving the car) shooting at a girl and her horse? (It’s not like it was Phar Lap.) How did she get back on Atta Girl with a broken leg? Did Atta Girl stoop down like a camel? My next book is going to be called The Mad Car, Atta Girl and Me and will answer all these questions. When I was in primary school I wanted to be an artist because I thought I was really good at drawing. I don’t know where I got this idea because my parents didn’t usually lie. 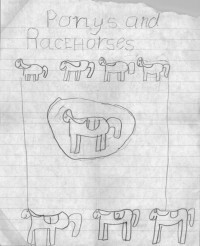 This is a drawing I did in Grade 3. This not only proves that you can love a thing without being able to spell it, but also shows that I am actually really bad at drawing. I can’t remember when I worked this out, but I wasn’t too bothered because by then I was focused on competing at the Olympics (I didn’t know what sport I’d excel at, but I was confident I would make it). 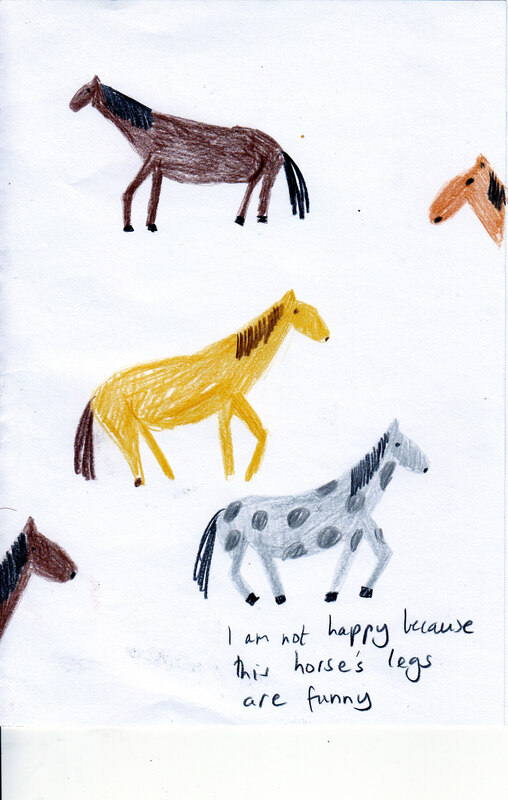 My main character in Stay Well Soon, Stevie, is also convinced that she’s really good at drawing. Some of Stevie’s drawings are included as illustrations in the book. I did the drawings myself, therefore suggesting that Stevie isn’t as good at drawing as she thinks she is. Some people might think that I deliberately drew badly to realistically portray the drawings of an eleven year old. However, that is not true. They are my best drawings. I tried hard. 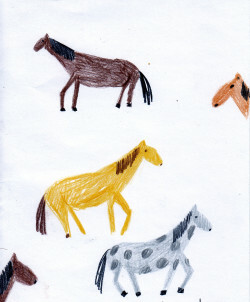 Here are some horses I drew for Stay Well Soon. I think I have really improved. My publisher referred to the drawings as “the artwork” as though they were proper illustrations for a proper book. I think she was being kind, but it’s still like a dream come true. I’m an artist.